I was wandering around; amongst green tuffs of moss, in the middle of cranberry marshland. The smell of twinflowers was intoxicating, thousands of forest flowers were guiding my way across this fairytale landscape. I knelt down on the forest path. My mind was inspired. 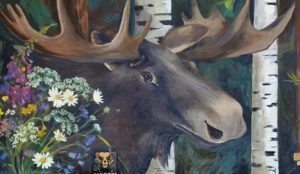 I was wondering: where do we Finns come from? Who are we, after all? What is our legacy to the world? Little did I know two years ago how Kalevala – our national collection of epic poetry and the quintessial book of mythology – would lead me to an amazing journey to myself, to all humanity. 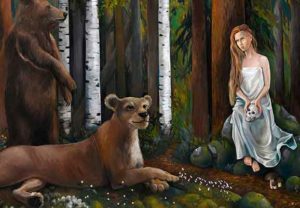 I have always adored stories, mythology and symbolism – and yet, kept some distance from the Kalevala verse, tetrameter, and the fabled narrative it uses. So, it was the forest that took me towards the birth of Finnishness and the fascinating whirlpool of our national sagas. You have to know your history, before you can look into the future, in search of answers. My mind was occupied with our sacred Kalevala bear – and the spells and sagas of his birth – and the the massive, powerful lion, the symbol of Finland, as presented in our coat of arms. 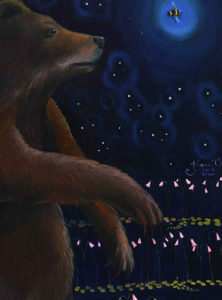 The bear, who roamed from the eastern countries, to end up as our national animal. The lion, walking majestically along the western king’s highways. They both blended into Finnish forest very naturally. My paintbrush was dancing on the canvas; the symphony of colors was conceived, as from the composer’s pen. 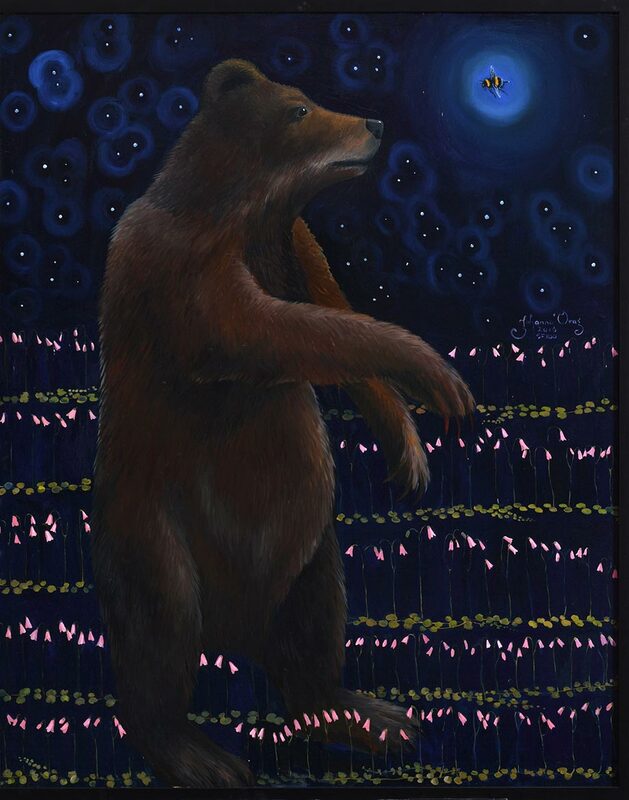 You can hear the echoes of the dance halls of the bright and clear summer nights, you can hear the chirp of the blackbird, sitting on the branch next to you. 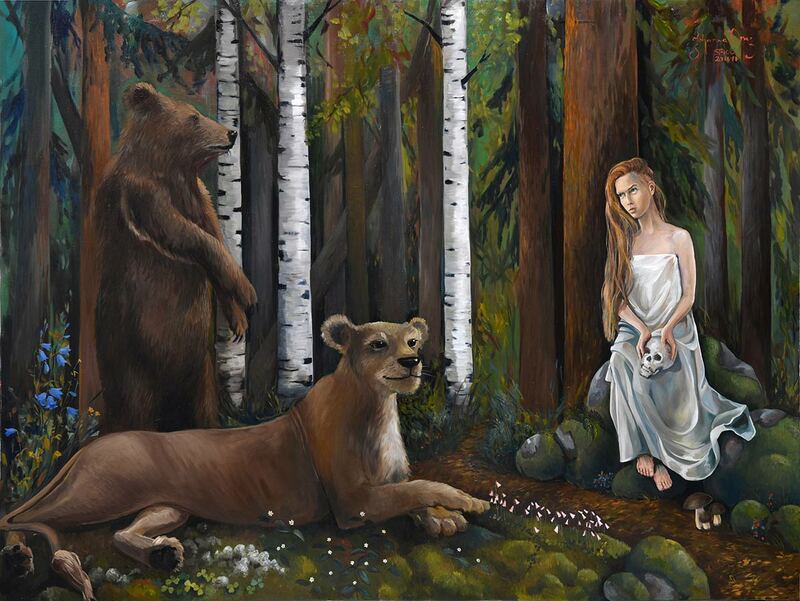 The Maiden of Finland walking along the path, sitting on the rock, ready to meet the Bear and the Lion. I wanted strenght, mythology, a powerful message. The questions were piling up, as the paintbrush was stroking myriac colors on the canvas, layer after layer. I was in a trance. The Maiden’s eyes are full of demands, defiance and perseverence. 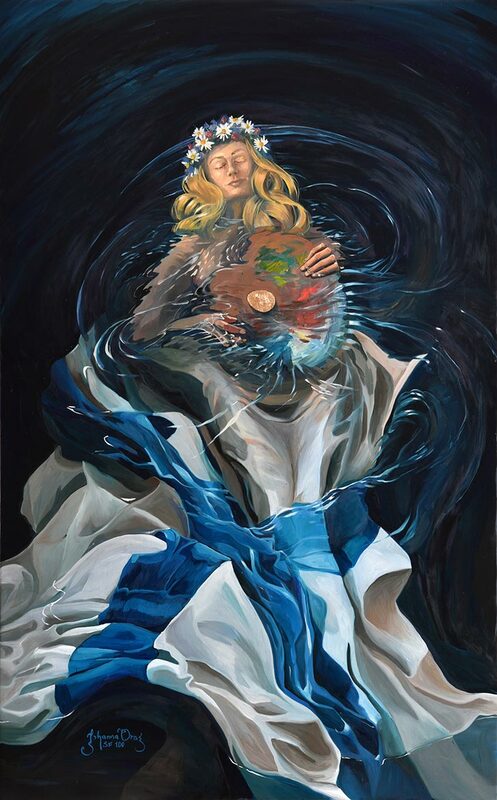 I am Finland; full of losses, pain and longing. Yet, I remain calm, tender, even frolicsome. My history has made me strong, powerful and independent. In my eyes you can see the waves of our thousands of lake; the clarity of the blue skies, reaching up, as far as the eye can see. My hand holds the mark of strength; the rebirth. I am ready to renew myself; to raise to a different level, to take new steps. What will the Bear and the Lion do? 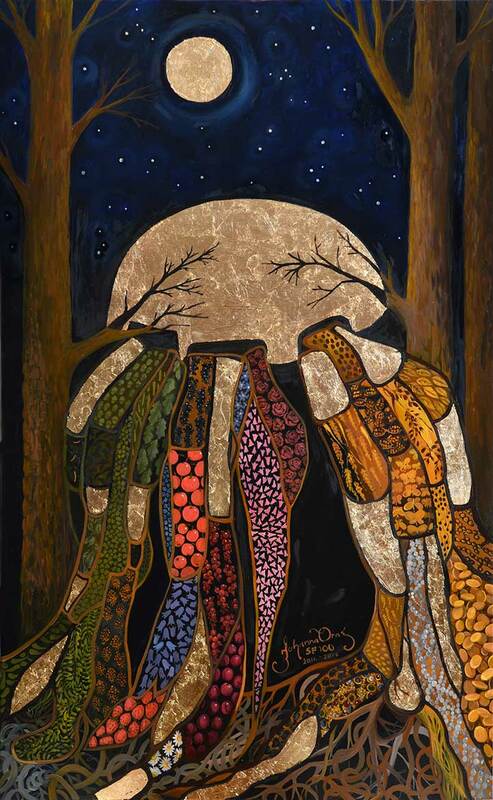 With the daughters of creation”. 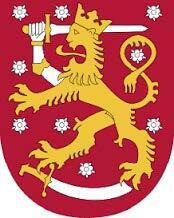 The coat of arms of Finland is the second official symbol of our country. It can be seen e.g. in the State Flags and it can used by the Government, various Ministries, the Defence Forces, the Supreme Court and the Bank of Finland. 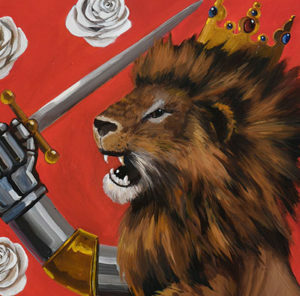 I was wondering, what is the message of that mystical feline, widely used in flags and coats of arms troughout the centuries? Where is he coming from? Where is he going? In my mind that noble wild cat came alive, as a modern symbol of strength and courage. 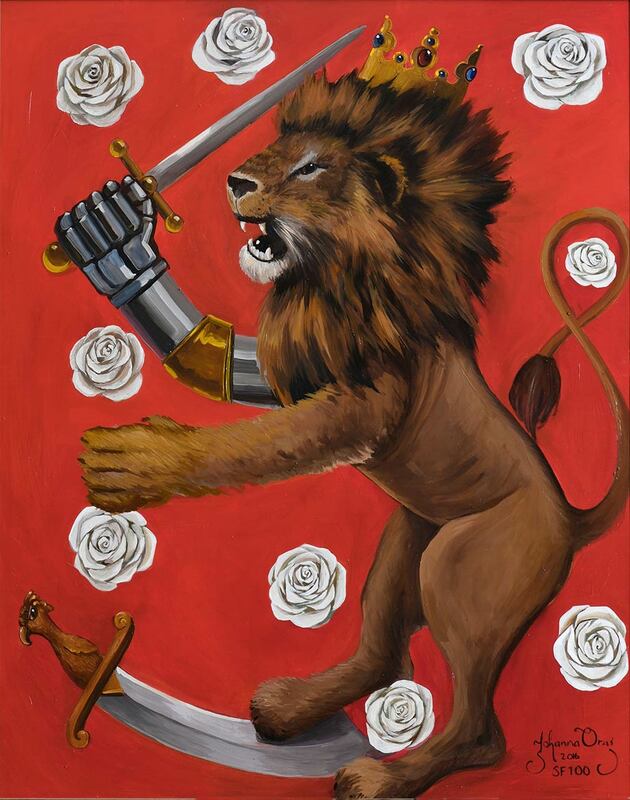 The white roses started to blossom and I can hear my lion roaring the message of peace; I see him looking into the horizon, aware and proud of his past – but ready and willing to face the challenges of the future. 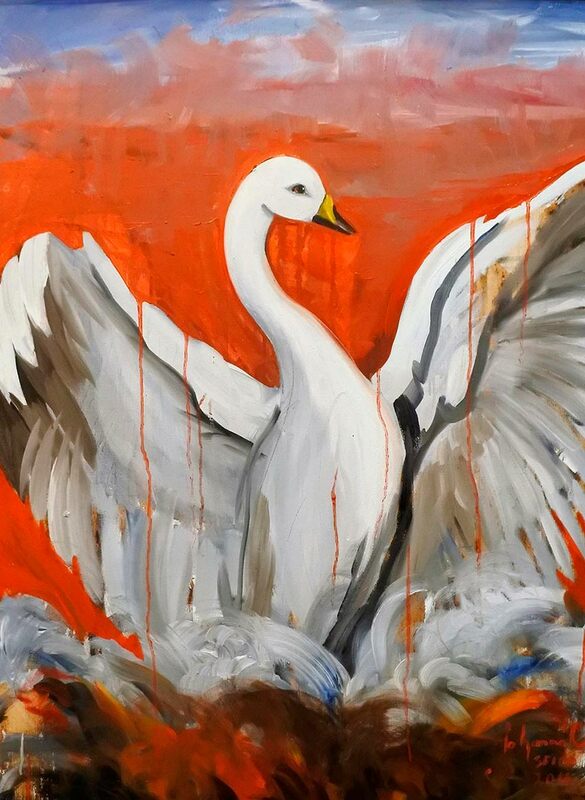 The history of the swan is full of symbolism; it has been seen as a messenger of the suffering of the Christ. A bird with a long neck, a bird that can’t be harmed. A bird that can see to the future, a bird that takes messages to the afterlife. Even Sarasvati, the Hindu Goddess of knowledge and learning, rides a swan. 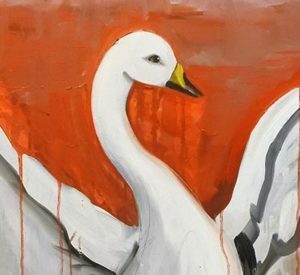 The swan is the national bird of Finland – but to me the important swan has always been “The Ugly Duckling”, by H.C. Andersen – no doubt the most famous swan in the world. As a little girl, I didn’t find myself attractive – I was discriminated, I was not part of the group. But that fairytale gave me consolation and strenght; one day even I can spread my wings and shine, just like the most beautiful swan can fly. My swan symbolizes freedom – liberty that never comes free – and hope. The swan spreads her wings and tells us, in the words of a popular Finnish song, how “Life is wonderful, no doubt, if you understand what it’s all about”. I fell in love with Ilmatar – the virgin spirit of the air – who so lightly glides in the waves of the primeval seas, without a worry about tomorrow. She wasn’t very busy in creating her own word; she had no timetables, no deadlines. She was waiting for inspiration. Ilmatar was like an artist, holding the palette by her bosom. And the colors from the palette were gliding out, towards the genesis, the creation of the world. The paints mixed together, creating a great miracle. This is how I saw her, as I was waiting for my own inspiration, sketching the goddess of air and water. The indefinity of the water, in shades of blue. Surrounded by gleaming, white silk. The stream carries the colors in the painting; we feel the surge of emotions surfacing, our blue-and- white-crossed flag. And the golden egg is just about to fall down; Ilmatar, wearing a garland around her head, as the water carries her and caresses her skin. The dream, forged out of iron. The Holy Grail of the Finnish mythology, the bringer of life, the cornucopia of richnesses. As I was studying and getting to know Sampo and different depictions of it, I was surprised to find out that there wasn’t a proper picture of Sampo. The artists have, for unknown reasons, avoided to paint that miracle – so I decided to challenge my own imagination and skills and to hammer out that magical Sampo, with the powers of my paintbrush. My Sampo is a source of radiating, mysterious power; it contains our legacy and our soul. It sparkles. It glows. It brings our dreams and their fulfillment within the reach of our hands. It is the source of all living, it is the philosopher’s stone. It is the eternal, inexhaustibe stream of abundance. It holds up the skies, it glitters like gold. My Sampo is life itself. 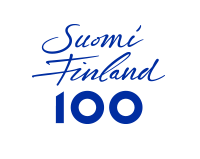 There has been a lot of conversation how we celebrate our 100-year old Finland and a lot “male” topics have dominated these talks. Glorious examples of our history as they are, but as a woman and as an artist, I want to give a pictoresque present to the Maiden of Finland. 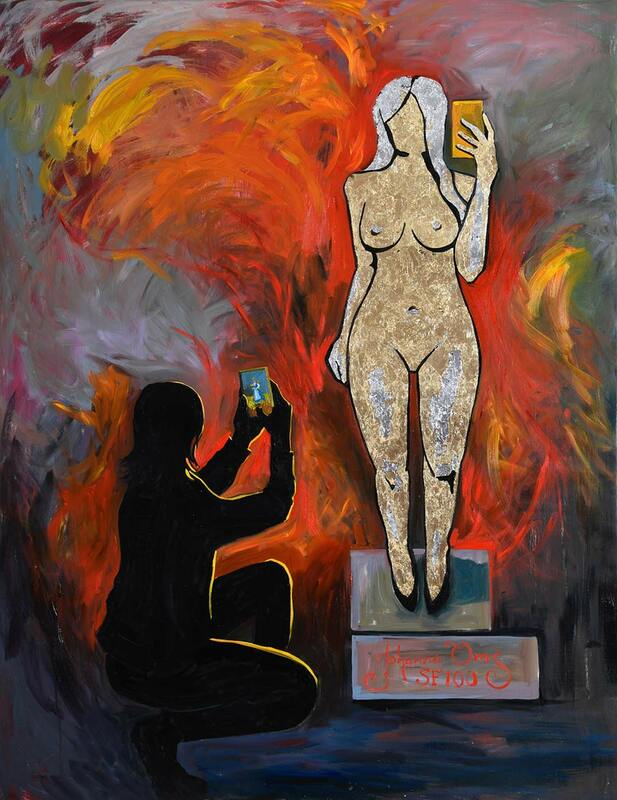 The Golden Girl is a modern version of the story of Ilmarinen – a skilled blacksmith and one of the main characters in Kalevala – who makes himself a bride out of gold. Today’s Ilmarinen would hammer himself a hot date, a perfect-bodied companion – who would be so satisfied with herself and her figures that she’d be busy watching and posting her own pictures from her Apple computer, in pursuit of even hotter followers and ignoring the poor smith completely. On the other hand; when Ilmarinen wants to take a picture of her perfect maid, who ends up on the screen? The perfect, natural Maiden of Finland, waiting by the cornfield, looking forward to meet his handsome male. 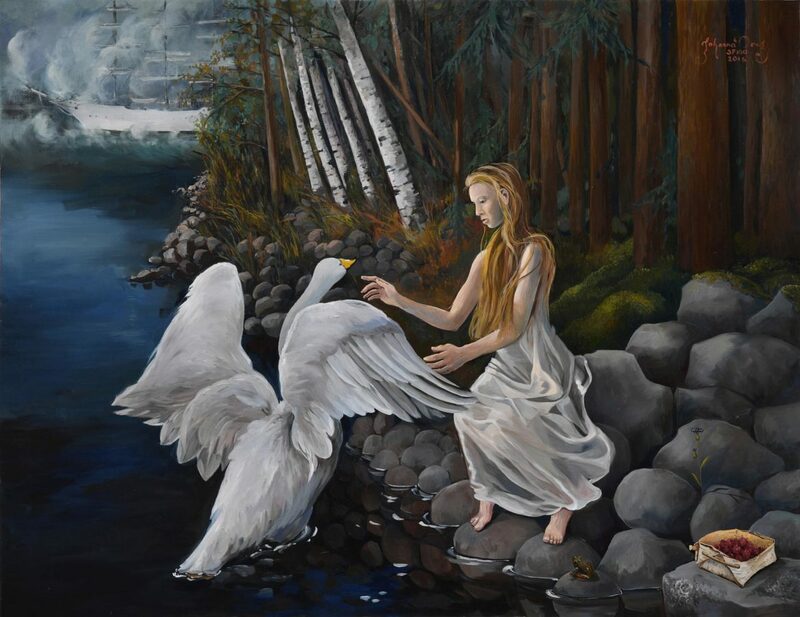 The Swan Song is a symbolic painting of Finland; a maiden who tames the wild swan and is keen to take care of our wounded national bird. In the background the legendary Swan of Finland glides across the morning mist, like a ghost ship, bringing the message; I’d like to go back in time; to be veiled, to sail away fom the grieving. 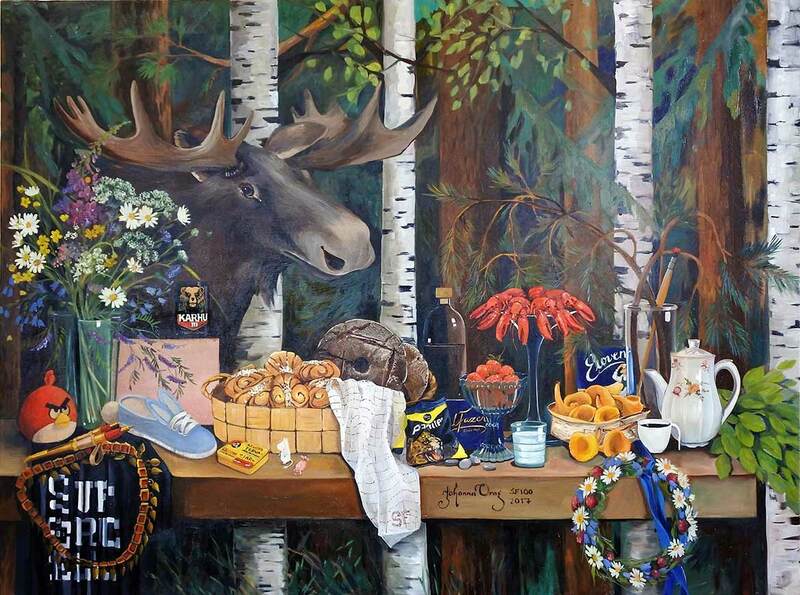 I wanted to compose a praise to Finnishness; an eulogy of our country in still life – and see how it turned out; the painting looks like an absurd altar of pop art! It is full of memories of those summers when we were showing the best sides of our country to our foreign visitors. This is the collection of their favorites; with these they fell in love. Here they are, full of emotions! When we talk about out fatherland, or motherland, freedom is one of the most important aspects – or the most important one – that almost everyone always mentions. This is why I wanted to approach the subject via a powerful and influental painting. So often we compare our soul to a bird, roaming around the skies, free. But also fire is a grandiloquent symbol of liberty. Fire brings light and passion. I wanted to capture that essential feeling of freedom, that is conceived by passion, that burning desire to make this world a better place. 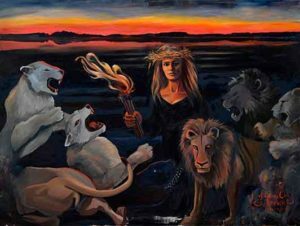 I set my paintbrush to fire and let the blazing flames to light up my path; just like my ancestresses before me struggled their way, towards a better future. Long live the burning heart that embraces the universe! Let the evil feelings and the beasts of the tales step aside! Begone the masters of darkness and destructible powers! After the storm, the sunset is at its most glorious beauty. Let the tranquil peace reflect from the beautiful, calm waters; across the crimson horizon. This roaring flame of freedom; shed your light wisely, share your warmth with us. Fire walk with me – so I can see.